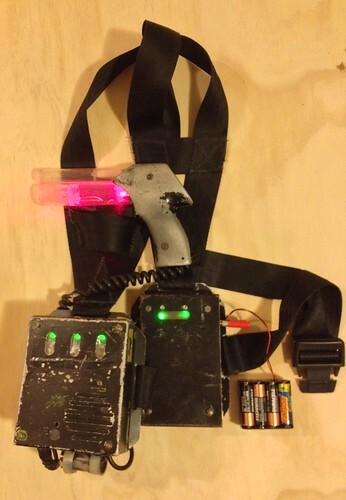 The laser tag industry started in 1985 with Photon. It came to Western Australia in about 1987 with Quasar, which was both the name of the gear and the name of the two Western Australian laser tag sites with Quasar gear, one in Fremantle and one in Northbridge. I first played in 1987, I think, at the Fremantle location; and joined the staff in Northbridge around 1989. I worked as tech staff until 1995, but not all of this was on Quasar packs, as we upgraded to new gear in 1992. Nowadays there’s a laser tag museum. As of October, their “wanted” page listed a desire for an early version Quasar pack. I had one, because after the site closed in about 2003, Christine Tonti-Filippini (who was also on the tech staff) gave me one. Through a mutual friend (Wombat, for those who know him) Erik Guthrie, current curator of the museum, learned that I had it and we agreed that I would give it to him in return for a $1000 donation to charity. He was more generous than he agreed to be, donating $1300, so my Quasar pack is now in the laser tag museum. Before it left, I took a few photos and stuck them on flickr. You can see where I’ve stuck together eight AA cells and some banana connectors to power it. Here’s the laser tag museum’s page on Quasar (later known as Q-Zar). This entry was posted in Miscellaneous and tagged laser tag, Quasar. Bookmark the permalink.